What is an Accessible Bathroom? Accessible Bathrooms promote ease of entry, exit, and performance of vital daily tasks by people of all ages and ability levels – up to and including bathroom users who rely on walkers or wheelchairs for mobility. Creating a bathroom that can be accessed by everyone is achieved through a carefully crafted floor plan, specialized fixtures & amenities, and appropriate equipment. If you are new to the concept of accessible bathrooms and are confronted with the task of setting one up, this guide will give you a first introduction to key aspects to be considered. For details on specific topics, follow the links provided in this article or browse this website’s menus above. Flush Flooring: Ideally, zero thresholds or steps should be present inside the bathroom and preceding the entrance to the bathroom. If thresholds cannot be avoided altogether, those that are present should be beveled and limited to 1/2 inch in height or less, which most persons using a wheeled mobility device can navigate over. Wide doorways and passageways: At a minimum, the doorways must be wide enough to allow a walker or wheelchair to pass through and there must be enough space present between each of the bathroom fixtures to allow a person using a walker or wheelchair to pass between, approach, and use each. The minimum required doorway width and space between fixtures will vary based on the size of the mobility aid used and an individual’s skills for maneuvering the device. 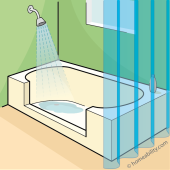 Curb-less shower: Namely, a shower with a flush transition present between the shower stall floor and the bathroom floor outside is the most universal option available for bathing and showering. 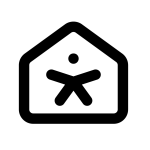 It can be easily accessed by everyone, including children and older adults, those who can walk easily and those who cannot walk at all (E.g. person who uses a wheelchair or rolling shower chair). Work surface heights: If space allows, install countertops with partitions of varying heights so all bathroom users, both seated and standing alike, can comfortably use the space. Space under sink: Open space should be provided below the bathroom sink so a seated user’s knees can slide underneath, allowing a seated user to easily reach the faucet and controls. Amenities: All amenities (electrical outlets, faucets, shower/tub controls, storage etc.) should be installed at heights that can be readily reached by both standing and seated users alike. Fixtures: The size & shape of the toilet, sink, bathtub and shower need to be carefully selected to ensure appropriate open floor space is maintained inside the bathroom. 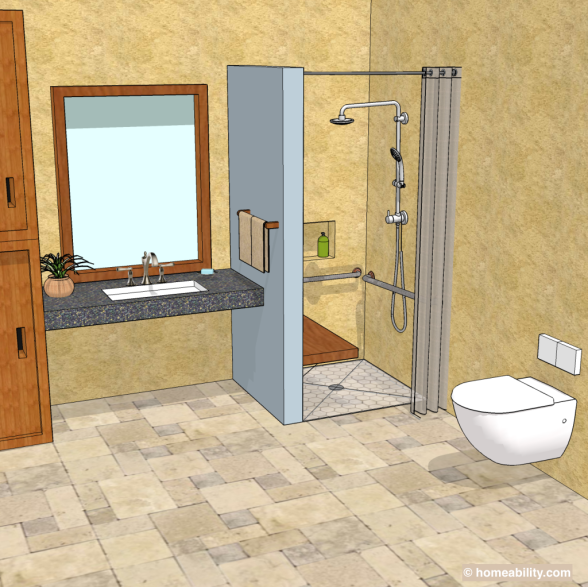 Bathroom Location: In multi-level homes, the ideal place to have an Accessible Bathroom is the ground floor. This way, if there is ever a time in life when navigating the stairs becomes difficult, it will be easier to transition to living entirely on the ground floor. To learn about bathroom layout and clear floor space design specifications in greater detail, please refer to our companion guide “Clear Floor Space” Guidelines for Accessible Bathrooms. Another key component in creating a great Accessible Bathroom is the selection of the right fixtures and equipment to enhance ease of use, safety, and convenience in performance of common bathroom tasks. 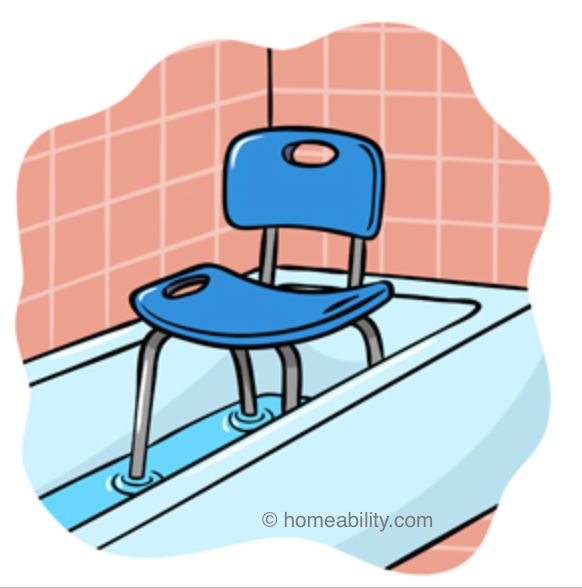 Specialized bath chairs, stools, or benches are available to turn existing bathtubs into a “seated shower”, while also eliminating the hazardous task of stepping over the bathtub wall. For those wanting to soak in a hot bath, but unable to maneuver themselves into and out of the tub, there are various types of bathtub lifts to support immersion, ranging from simple portable bath lifts to permanently installed models. Specialized bathtubs with integrated doors in the side-wall or a mechanical seat lift can make taking a bath safer and easier. “Curbless Showers” (aka threshold-less showers) have potential to completely eliminate the need for adaptive equipment or a caregiver’s assistance. Curbless showers can come in the form of pre-fabricated shower stall or can be custom-built by a contractor on site. 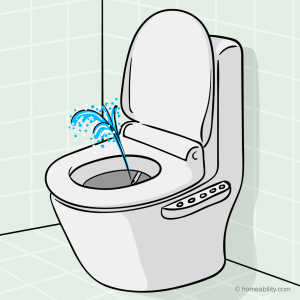 A taller toilet can be installed or an existing toilet can be adapted by adding seat risers or pedestals to elevate the seat height and make it easier for some persons to get on and off of the toilet. 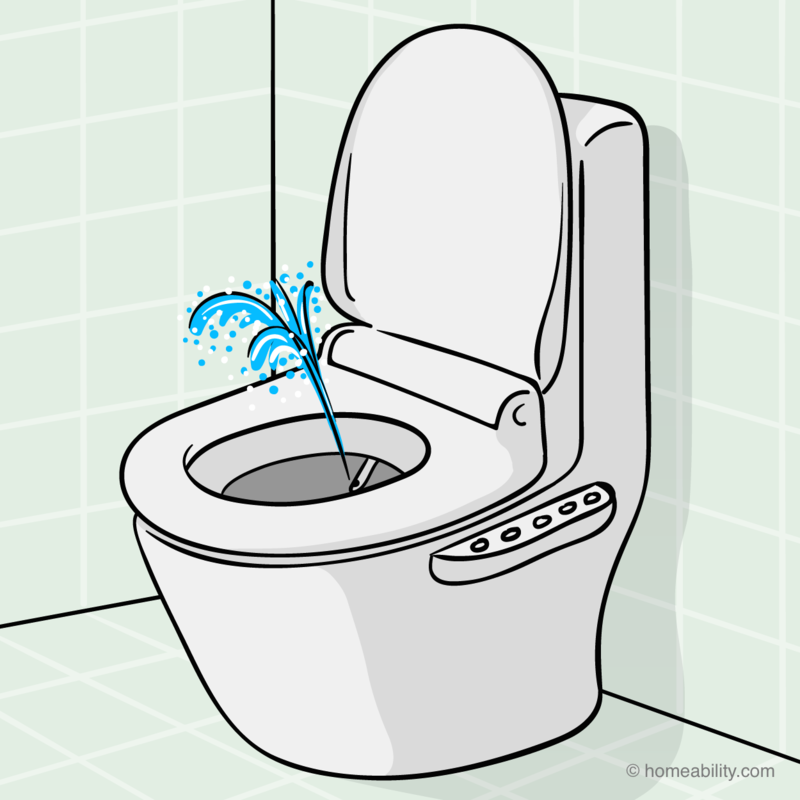 Toilets with integrated water spray systems (“Bidet Toilets“) enhance ease of personal hygiene after using the toilet. 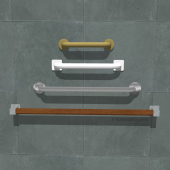 Grab bars (support rails to hold on to) can be obtained in a multitude of styles and shapes to improve stability when lowering onto or rising up from a toilet or when stepping into or out of a bathtub or shower. Sinks and vanities can be purchased that accomodate the needs of both seated and standing users, incorporating shallow sink bowls, recessed piping, and open space underneath the sink to accomodate the knees of a seated user. Cabinets designed with pull-out shelves and “toe-kick” space below enable those with wheelchairs to approach, see, and reach all of the contents inside. Other helpful items commonly used in Accessible Bathrooms include: Full-length mirrors or hinged mirrors for supporting seated and standing users, installation of motion-activated lights and faucets and/or lever-style door handles and faucets instead of the knob-style ones that can be difficult for persons with arthritic hands to operate. People are sometimes afraid that adding a large number of accessibility enhancing features could interfere with the bathroom’s style and design integrity – possibly causing an institutional, hospital-like appearance. If this is of concern to you, you will be excited to learn that there is a wide palette of fantastic products and design tricks now available to blend accessibility features invisibly and elegantly into the bathroom’s overall design theme. This approach is part of a style philosophy sometimes referred to as Universal Design. Examples include installing decorative grab bars that dual as soap racks, towel racks or toilet paper holders. Sinks can be fitted with pull-away cabinets underneath that can easily be converted into roll-under sinks if there is a time in life when sitting for grooming and hygiene tasks is needed or preferred. More tips and tricks for making an Accessible Bathroom both functional as well as aesthetically pleasing can be found throughout the Homeability guides. Accessible Bathrooms are one of the cornerstones in independent living. In fact, not having access to a well-arranged and suitably equipped bathroom is frequently identified by medical professionals as one of the main roadblocks that prevents people from living independently. For example, the absence of an accessible bathroom often prevents medical professionals from sending a patient home from the hospital – and may force them to refer the patient to a facility instead. 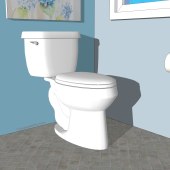 Homeability.com therefore strongly recommends taking the topic of accessible bathrooms seriously when creating a future-proof accessible living space. If you are planning a full bathroom remodel and the available space allows, it is best to build the bathroom so it will readily accommodate all types of mobility aids up to and including electric wheelchairs and scooters. It’s much better to have too much space than too little. In particular, it is strongly recommended to consult our detailed “Clear Floor Space” Guidelines for Accessible Bathrooms. One topic that comes up frequently in the context of Accessible Bathrooms are “Walk-in Tubs”. They are aggressively marketed as a senior-friendly, convenient, and future-proof bathing solution. In general, homeability.com strongly cautions against walk-in tubs because they can come with significant drawbacks, problems, unfulfilled expectations, and buyer’s remorse. For more details, visit our article on the topic of Walk-in Tubs. If a “soaking bath” is a high priority for you, Slide-in Tubs may be a better alternative. After working with thousands of seniors and people with disabilities since the 1990’s, we have become a big fan of the accessibility and versatility of Curbless Showers: They come in prefabricated as well as custom-built types and can be set up to truly cater to all ages and ability levels. They are a fantastic, future-proof accessible bathing solution! 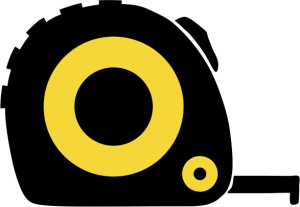 Toilets for Disabled Person: Which type is Best?